This is a bit of a showstopper – the sponge is flavoured with Sugar and Crumbs Pink Lemonade Icing Sugar, and decorated with buttercream roses. It’s a fabulously pink and flowery confection, but you can of course choose whatever colour you like. Preheat the oven to 200°C (180°C). To make the sponge, cream together the eggs and butter, and then beat through both types of sugar, and then finally the self-raising flour and baking powder. Divide the mixture between two greased & lined sandwich tins and bake for 30-40 minutes, or until a tester inserted into the middle comes out clean. Allow to cool for a few minutes before turning out onto a wire rack. When the cake is completely cool, prepare the buttercream. First of all, weigh out 200g of icing sugar into a bowl with the butter, mix the icing with the butter until you have a nice smooth buttercream. Lay one of the cakes on your cake stand, and spread buttercream on top so it’s about 5mm thick. Sandwich with the other cake. Cover the whole thing with a thin layer of buttercream, making it thicker in the gap between the edges of the sponges so that you have a smooth, flat surface all over. Put the rest of the buttercream in a piping bag with a star nozzle like the wilton 2D. Pipe rosettes onto the top of the cake and round the sides (you may find it helps to practice on a plate first – you can scoop up the buttercream you use and put it back in the bag afterwards) and fill in the gaps with little stars. 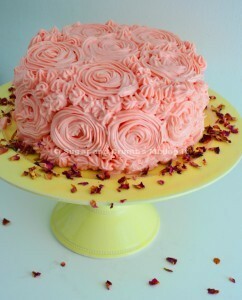 Finally, decorate the cake stand with dried rose petals.